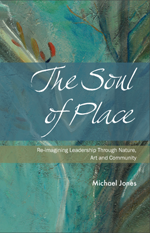 Michael has shared his perspectives on The Soul of Place through keynote presentations, workshops and community conversations. As a keynote speaker, Michael has brought his message on Re-imagining Leadership and the Soul of Placemaking to The Banff Centre, Suncor Foundation, The Greenleaf Centre for Servant Leadership, The Creative Education Foundation, Fetzer Institute, Quaker Foods, The International Leadership Association, Tamarack Institute and many others. His work has been described as “… intelligent open, genuine and transformational”. Michael has also offered deeper teachings on the Soul of Place as a Senior Associate with The MIT Dialogue Project and Dialogos Inc., a leadership faculty with the Executive MBA and Senior Leadership Programs at The Center for Learning and Transformation, University of Texas, San Antonio; as a thought leader and leadership faculty with The Tamarack Institute Communities Collaborating Conferences, as a Senior Fellow with the MacGregor Burns Academy of Leadership and with The Fetzer Institute dialogues on Leading for Transformation. As a conversation curator Michael has participated in the design and facilitation of many unique conversations on the soul of place with boards, senior leaders, communities and organizations in a variety of settings including; The Search for Common Ground- Canadian Tire Group of Companies, The Power of Place; The Canadian Index for Well Being, Connecting for Our Future; with Quaker Foods and PepsiCo. Global Nutrition Group, Re-visioning Our Future with The Cincinnati Contemporary Arts Centre and Healthy Aging: Innovating Together with the health care community in Atlantic Canada. He is also the creator of the Wasan Dialogues – an annual series of week long forums on Wasan Island in the Muskoka region of Ontario for generative dialogues on recovering the soul of place and creative placemaking which have brought together artists,social innovators, designers,community builders and leaders in creating living systems to share their stories and questions related to creating a new narrative of possibility that is place-based.